from 3 pcs. 1,99 EUR ea. from 10 pcs. 1,75 EUR ea. from 20 pcs. 1,63 EUR ea. from 40 pcs. 1,53 EUR ea. 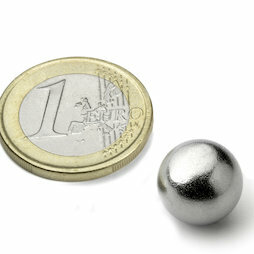 Ideal to combine with our (non-magnetic) steel spheres, which are exactly the same size. The spheres will be delivered in a small transparent tube. The magnetic sphere (in the middle) shimmers slightly bluish because it's chrome-plated. The surrounding steel spheres are nickel-plated. In this pile of steel balls, there is only one magnetic sphere K-13-C.